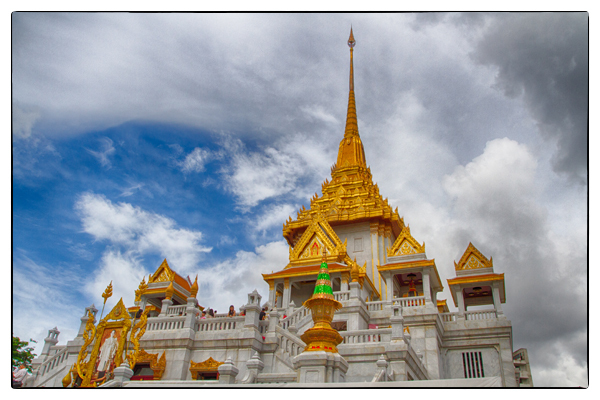 The Wat Traimit Temple, home of the Golden Buddha, in Bangkok. Photo by David Lansing. We were stuck in traffic on our way to the Pak Khlong Market, the epic Bangkok flower mart. Inching our way along, Ketsara casually mentioned that the Temple of the Golden Buddha, Wat Traimit, was on our right. Then the traffic cleared and suddenly we were in a round-about with me thinking, Waiti! Why are we not stopping to see the Golden Buddha? And right at that moment, Mr. Johnson, a Canadian-born Dominican who lives in New York and works for Tourism Thailand (I know, very confusing, right? ), says, “Khun Ketsara, could we stop at the temple?” I was elated. Ketsara spoke quickly to the driver who reversed directions and, minutes later, we were inside the Temple of the Golden Buddha. 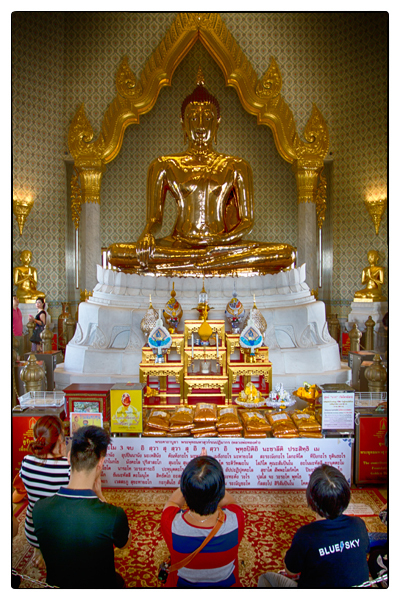 I wanted to see this wonder not so much because it is the world’s largest solid gold Buddha (although I’ve heard that while the head, arms, and legs are all solid 18-carat gold, the torso is “just” 3 or 4 inches of solid gold), but because of the story behind it. The Golden Buddha. Photo by David Lansing. It seems that the Buddha was discovered accidentally in 1955. At the time, the 13-foot-high Buddha was nothing more than a rather plain-looking stucco Buddha that had been unearthed when workers were extending the port of Bangkok. For 20 years the sorry image sat unnoticed at the Wat Traimit Temple until one day a crane dropped it while moving it out of the way. The plaster cracked, revealing the gold Buddha beneath. Evidently the statue had been encased in stucco since sometime around 1750 to hide it from Burmese ransackers. What seems odd to me about all this is how could they not know that a 13-foot-high Buddha made out of stucco could not possibly weigh five tons? I mean, when those construction workers first unearthed this Buddha in 1955, didn’t they think it was a little strange that it weighed so much? A plaster cube 5 feet on a side would weigh almost 9 tons. The photo seems to show a Buddha shorter than 13 feet. Was the whole of the Buddha and the pedestal encased in plaster? If so, the plaster weight would be relatively large. Okay, Fred, you got me. It just seems to me that a 13-foot-high statue made out of solid gold is going to weigh more than one made of stucco. And the photo is a little deceiving–the statue is bigger than it looks. Heh. So the question may be more about the claimed solidity of the statue. Still, disguising a free-form object of any size in plaster or cement would require perhaps 3 times more plaster than object. This rough calc suggests that the stony result would weigh much, even many times more tonnage than its hidden content. Perhaps also intriguing, what else was so disguised and remains undiscovered; has anyone speculated or looked? Story upon story?